The Oklahoma Department of Career and Technology Education reports that in 2014, there were 152,227 secondary students and 394,650 post-secondary students enrolled in vocational programs around the state. These vocational and trade programs are delivered through Oklahoma’s comprehensive high schools, technology centers, skill centers and public community colleges. Earning technical certificates or associate degrees in Oklahoma’s growing sectors like healthcare, education, and technology can put students on the fast-track to rewarding careers. This page includes information on the vocational programs available in Oklahoma and what jobs are available to graduates in the state. 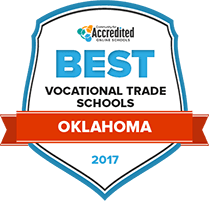 Look no further than these rankings for an analysis into the vocational and trade institutions available to Oklahoma's residents. Some of the more popular programs at community and career colleges focus on the construction, manufacturing and allied health fields, all of which are growing fast in Oklahoma. Our rankings take into account numerous factors that matter, including tuition, financial aid, student-teacher ratio and the like. At Tulsa Community College, students can go for several two-year career-oriented programs, from accounting to engineering technology to interior design. Many of the categories offer some very specific programs to make sure students are heading in the exact direction they want career-wise, such as the degree in surveying technology under the engineering technology category. Students generally take about 18 hours of general education requirements and around 44 hours of core courses that prepare them for their chosen field. Many of the programs are directly supported by the workforce development center to make sure students are entering the workforce right upon graduation. Redlands Community College offers several Associate in Applied Science degrees to get students right into the workforce upon graduation. Students can pick courses in topics like informational technology, business administration technology, child development, criminal justice, emergency medical technology (paramedic), equine studies, nursing and sustainable agriculture. Students receive a basic general education, while getting a highly specific education in the technical career of the student’s choosing. For instance, the paramedic program requires 18 hours of general education, 12 of support science courses and 39 hours of occupational specialty courses. Students will be prepared to take any licensing exams that may be required, like the NCLEX for nursing students. Murray State College has several associate programs relating to direct career entry within their Associate in Applied Science degree offerings. Students can choose from several businesses offerings, child development, gunsmithing technology, nursing, occupational therapy assistant, physical therapy assistant and veterinary technology. The business track offers several specialized fields like legal assistant, medical office assistant and retail management. Students take courses in general education like history and humanities, core requirements relating to the field, more technical core requirements (many including internships) and several program electives related to the chosen career. At Carl Albert State College, students who wish to enter the workforce after their two-year degree may wish to major in an Associate of Applied Science degree. These are geared for both direct workforce entry and getting a higher, more specialized degree. The associate degrees cover many traditional vocational programs: applied technology, child development, computer technology, health information technology, nursing, occupational health & safety and physical therapy assistant. Students take general education requirements and core courses that directly prepare them to enter the workforce. General education requirements vary widely between different programs in the applied science degrees. At Eastern Oklahoma State College, students who want to enter the workforce directly typically choose to focus on AAS (Associate in Applied Science) two-year degrees. These degrees are offered in the school's agriculture division, the behavioral and social science division, the business division, the nursing division and the technical studies category. The technical studies category consists of a naval technology option. Students take general education courses and program requirements. Students can typically choose from several general education electives to customize their education. At Rose State College, students who are interested in entering the workforce after graduation may choose to pursue an Associate of Applied Science (AAS), though the school collaborates with four-year colleges and universities to offer classes that can be transferred to a four-year institution at a later date. Some degrees also provide a level of specialization that comparable to obtaining a certificate in the field. Students can pick from several categories, though some of the more unique programs include library technical assistant, networking/cyber security and environmental technology. The businesses category allows for several specializations like consumer finance and marketing-social media. Oklahoma City Community College offers several direct career-related programs in their Associate of Applied Science (AAS) degree programs. Programs like administrative office technology, geographic information systems and speech language pathology assistant are designed to help students to enter the workforce directly after they complete their degrees. Students take courses related directly to their chosen career. If the field requires it, students should be prepared to sit for any necessary licensing exams. OCCC offers the “OCCC job skills guarantee” for its AAS degrees, because the school strives to ensure students will be fully prepared to enter the workforce. On-the-job learning is provided in Northern Oklahoma College’s Associate of Applied Science (AAS) programs. These programs are specifically designed to meet the needs of students who are interested in a specific trade and would like to achieve a career in that field, ideally immediately after graduation. Because many of the skills acquired in these programs are highly valued by employers, the schools strives to prepare graduates to be hired after graduation. Academic advisors are on hand at Northern Oklahoma College to help ensure students are taking the classes necessary to graduate in a sensible timeframe. Vocational and trade schools in Oklahoma serve an important purpose ensuring the workforce has the knowledge and skills needed to qualify for specific careers. With 460 public high schools and 29 community colleges to choose from, it’s important for vocational and trade students to search for the school that will best help them meet their career goals. The following tool is designed to help students search for vocational and trade schools that fit their needs. The most popular vocational programs in Oklahoma are those related the health science with 13,589 students enrolled. In 2013, 95 percent of secondary and 44 percent of post-secondary CTE students earned a credential, degree or certificate recognized by the industry they were training to enter. In the 2013-2014 school year, there was a total of 71,564 students enrolled in Oklahoma’s vocational programs. In 2013, there were 3,500,981 female and 3,981,299 male vocational and trade students enrolled in Oklahoma schools. The credentials that students earn in Oklahoma’s vocational and trade programs certify that graduates have learned necessary skills to perform a specific job. A large portion of Oklahoma's population earn vocational and trade degrees: students in Oklahoma earn almost two times as many one-year certificates than the national average. Over the past five years, these students have showed technical skills attainment above the national performance levels, according to the Perkins Collaborative Resource Network. The following table provides details of the certificates and degrees earned by Oklahoma’s students compared to the national average. The Oklahoma Employment Security Commission reports that between 2008 and 2018, over 39,000 jobs will be added to the state’s fastest growing industries, including healthcare, transportation, scientific and technical services and finance. Oklahoma is home to a thriving healthcare industry, with hundreds of hospitals and other medical facilities. Oklahoma's vocational and trade schools provide training and certification for nurses, medical and nursing assistants and dental hygienists. In non health-related industries, both teacher assistants and paralegal positions are growing careers in Oklahoma. The data below provides a look at the vocational and trade occupations in Oklahoma expected to have the most growth in the next decade and the median salary for each industry. Oklahoma City is the largest city in Oklahoma and has many job openings for individuals with vocational and trade degrees. Oklahoma City is home to 20 general and surgical centers and four facilities that deliver specialized care, employing over 60,000 workers. Students in vocational schools like Heritage College-Oklahoma City and Platt College-Central OKC can train for jobs hands-on in these facilities. Both College-Oklahoma City and Platt College-Central OKC offer training for the healthcare industry, including surgical technology, massage therapy, health care administration, dental assisting and licensed practical nursing. Oklahoma City Community College offers certifications in insurance, accounting technology, general business and clerical services. These programs prepare students for Oklahoma City’s growing business services sector, including careers in customer service, research and development, business consulting and employment service companies. Online resource that helps Oklahoma City residents find internships, attend career fairs, and explore job tips. Career postings and job search for Oklahoma residents, sponsored by the state’s NewsOK. This agency is responsible for overseeing vocational and trade education in the state. Students can learn about vocational programs in Oklahoma offered at the high school and college levels and find out more about the most in-demand jobs in Oklahoma. The Oklahoma Department of Commerce’s website includes information on economic development, business sectors and the state policies that govern businesses. Students can use the website to learn more about the skills business owners want employees to learn before starting a career. Provides employment data for the state, including information on job numbers in specific sectors.